Zimbabwe President Robert Mugabe has ruled his country with an iron fist since 1980 and next month he will turn 93 with ambitions to run the nation until he is nearing his 100th birthday. He believes he is the only person to lead his country, and Zimbabwe's ruling Zanu-PF party on Dec. 17 chose him as its candidate for the 2018 presidential elections. His political opponents accuse the Mugabe family and a military clique of running the southern African nation that neighbors South Africa as a personal fiefdom. The role of his wife Grace Mugabe was highlighted over a spat after she had purchased a diamond ring for more than one million U.S. dollars. A Roman Catholic priest caused a stir when he castigated Grace Mugabe, linking her to corruption for acquiring a $1.3 million diamond ring at a time when many Zimbabweans are going hungry. Father Rungano Muchineripi of St. Johns Parish in Budiriro, Harare, was speaking at a funeral service for a woman who collapsed on her way to Zimbabwe from South Africa recently, NewZimbabwe reported. Without naming her, he used Grace Mugabe as an example that there is an evident lack of love among Zimbabweans. He said, "There is a lot of corruption in this country and if people had love for each other we would not be seeing someone buying a ring worth millions whilst the nation is hungry." "Bond notes also show that the level of corruption in this country has become unbearable. We are now confused and do not know what to do about it," the priest said referring to a cash shortage in the beleaguered southern African nation. President Mugabe and his wife were spending a month holidaying in Asia over the Christmas period when the priest made his sermon, NewZimbawbe reported. "How can someone afford to be on holiday in the Far East in times like this?" Mugabe's former vice president and now rival, Joice Teurai Ropa Mujuru, said Jan. 1. "Mugabe and Zanu-PF have neither the competence nor commitment to address the self-inflicted problems that we face," said Mujuru who now leads Zimbabwe People First in a New Year's message. Analysts and opposition leaders say the president had rigged three previous elections, and this claim has been reiterated by Mujuru, who was a fierce ally of Robert Mugabe's until 2014. Mugabe became president of Zimbabwe when the country gained independence and he stirred international controversy with his policy of land seizures in 2000. The government said it would give the land back to the people, but critics of the process said local people living on the land were displaced in many cases and the land apportioned to ruling party elites. Before that Zimbabwe was considered one of Africa's food baskets. Now it is one of the poorest nations in the region and it struggles to feed its people. Mugabe has says the country's economic decline is due to sabotage of his economic policies by Western critics. The Mugabes were married by a Catholic cleric in 1986, and the president was brought up in the Catholic Church. During his presidency, however, he has periodically been at loggerheads with Catholic leaders. A Harare judge has ordered Grace Mugabe to return three properties that she seized from a Lebanese businessman in the botched $1.35m diamond ring deal. Reports in November Grace Zimbabwe's First Lady bought the ring from a company owned by Jamal Ahmed, but later rejected it opting to have a refund. Ahmed approached went to as his properties were confiscated by the Grace Mugabe over the issue. In December the Zimbabwe High Court ordered her of Ahmed's properties which are in exclusive Harare suburbs. High Court judge Clement Phiri ordered the president's wife to remove her representatives from the properties that she seized after Lebanese national Ahmed failed to repay the money paid by her for the diamond ring. The ring had been meant to be Mugabe's wedding anniversary to Grace as 2016 marked the 20th anniversary of their wedding. 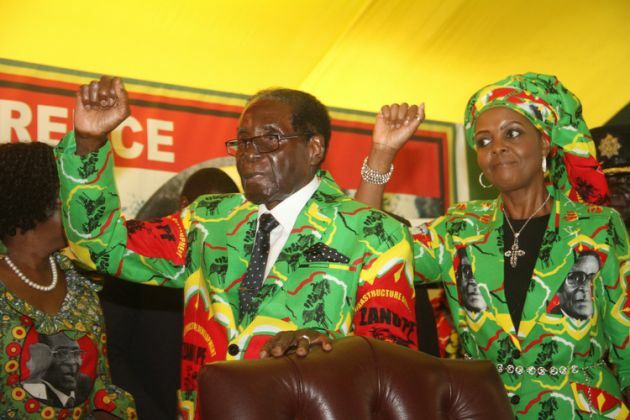 Grace Mugabe has stated ambitions to take over her husband's decades-long presidency. Another Zimbabwean newspaper report in November said Grace Mugabe had told the ruling Zanu-PF party women's league that she is already the president, as she "plans and does everything with President Robert Mugabe." Mashonaland West Zanu-PF women's league chairperson Angeline Muchemeyi said, "Grace told an executive meeting that she is 'already the President' and would not want to be appointed VP, as it was a lower post, NewsDay reported. "The First Lady said I'm the wife of the President, I'm the president already ... I plan and do everything with the President, what more do I want, for now the position of the women boss is enough." Grace Mugabe is currently the Zanu-PF women's league secretary, a position she has held since 2014.